My first ever metal detecting trip was with the Garrett Ace 250, I was actually allowed to borrow it from a friend. I’ve been hooked ever since I placed my order within the week of trying it and I still use it today 6 years later. It really is a great piece of kit. It’s not my main detector but sometimes I still bring it out just because it’s so light and user-friendly. For the beginner treasure hunter looking to find gold, jewellery, relics and more while treasure hunting; the Garrett 250 metal detector is a good entry-level choice. It’s budget friendly, fairly straightforward and easy to use. Today, we’ll be reviewing and examining the features that have made it one of the top-selling metal detectors out there. And what you should expect should you decide to get one. The Garrett Ace 250 is engineered, manufactured and assembled by the largest metal detection company in the U.S.A; Garrett Metal Detectors. It is an affordable detector and is mainly advertised for beginners and home utility. It is lightweight (weighs less than three pounds), and very comfortable for you to use. And while it is targeted at people who are new to the hobby, it also has enough features to keep experienced treasure hunters happy. Some of these features include; adjustable sensitivity and depth settings, pinpointing, custom notch discrimination, 6.5×9″ ACE coil, etc! Bear in mind; learning to use this detector effectively will take some time and practice because it isn’t an ordinary entry-level metal detector as it comes loaded with features normally reserved for mid-entry level metal detectors. Having highlighted the above, let’s now discuss the features. The Ace 250 has a long list of features, I’ve gone ahead and summarized the most important below. 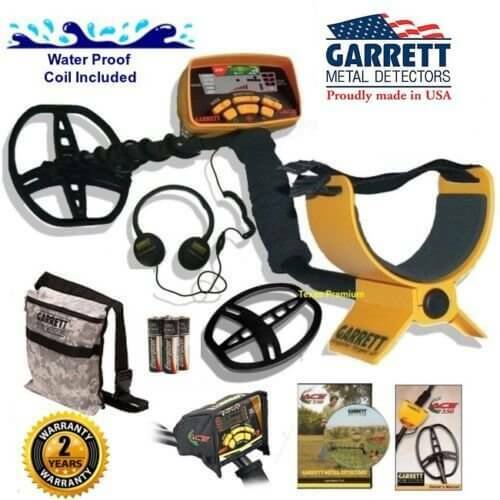 The Garrett Ace 250 Metal Detector comes with 6 push-buttons; Power, Discrimination, Mode, Sensitivity, Pinpoint, and Elim (short for eliminating). The Power button is a simple one-touch operation and the machine powers up. The Discrimination button is used in conjunction with the Elimination button and is used to eliminate specific items while out hunting. The sensitivity button increases or decreases the sensitivity of the machine, while the pinpoint button determines the exact location of a target. All metal: Detects all metals including Iron. Jewelry: Ignores items such as bottle caps, and nails. Custom: The custom settings can be programmed using the elimination and discrimination to select individual specifications. All the buttons are big and clearly labelled; making it easy when setting it up, but not so big as to crowd the feedback part of the display. It comes with a 10” simple LED display for easy functionality and sweeping accuracy. The display bears advanced sensitivity functions and an electronic pinpoint feature and is easier to read and interact with than a lot of the competition. The graphics target ID appears at the top of the screen with easily identifiable hash marks that are ideal for quick glances. The depth indicator appears to the right; numbered and providing permanent feedback about how deep (up to 8 inches down) a target is. The display also has a standard battery indicator and not just the low battery warning that pops up with most other detectors. Most beginners should find the 250’s standard coil adequate. The search coil is able to fake out trash metals; it’s also waterproof for movement in shallow waters and is useful should the sensitivity settings be further increased. Bear in mind; the control panel is not waterproof but you can purchase waterproof housing for this at a low cost. Battery Life: The Garrett Ace 250 metal detector has up to 30 hours battery life. This ensures that you can be on the field for long hours without having to worry about low battery as is the case when using other metal detectors. This is good for a number of reasons, aside from the obvious but it is able to run 30 hours from 4 x AA batteries, I can’t even get a torch to run an hour on that! There are detectors out there that will have built-in batteries that can be recharged. It’s up to you whether you take that as a positive, but it’s a big reason why Garrett is able to offer this machine at such a low price. bell tone that allows coin shooters collect coins. And while this may not be useful if you’re relic hunting; coin shooters will welcome hearing that additional confirmation. Target ID: A very useful visual guide on how far down what you’re detecting is beneath you. As you can see from looking at the LCD screen above, there is a bar that shows the sensitivity, the more full the bar gets the closer/more detection there is. If it is something large or close it will give a higher reading than not. This is a good way to decide whether something is too deep for you to dig it up or not. Sometimes when reading reviews online I get a good list of the features, the pros, and cons but you don’t find out what the product is actually like? Or is it just me? Having used this detector for over 4 years I think I’ve got a good grasp of what this machine is like when it’s actually being used. Watch the video below, it’s an instructional video of how to get the best out of the model. The all important question, I mean it could be the best machine in the world but if it costs too much what is the point? Well, you’ll be glad to know the Ace 250 comes in around $250, a bargain when you think of the technology involved with this machine. There are packages available that range from $250-$350, which depending on the use you’re getting out of it will determine what package is good for you, to look at the whole range click here to go through. The Garrett machine comes with a 2-year warranty. And while this short two-year limited warranty may not be on the high side, they adequately make up for it with their outstanding customer support, online instructional videos, and well-detailed FAQs. You may want to note that other people have mentioned how the Ace 250 can become a little temperamental in highly mineralized conditions, giving off an increased amount of false signals. Also, there is no volume control on the actual detector; however, you can purchase a good pair of headphones that have a built-in volume control. The Garrett Ace 250 is a good metal detector; it’s easy to use and has lots must-have features which, once mastered, will allow you to find a lot of coins, jewellery and other cool relics of the past. It is a treasure magnet and simply one of the best metal detectors for beginners that you can find! On a bit of a budget, would you recommend this over the 150? Hoping to get my grandson his first detector! Hi Jeremy, personally there isn’t a better bang for buck detector than the 250, however if it is for a child I would recommend the bounty hunter. That’s very strange, have you spoken to them? I haven’t had that problem nor anybody I spoke to. Hopefully you can get it sorted Garrett are usually very good at dealing with problems. Ken try this, I can’t say I’ve heard of anybody else having problems with them. Is this still the best option in 2017? It depends on your situation, what you’re looking for, experience etc. However, would I recommend the 250 in 2017? Absolutely!